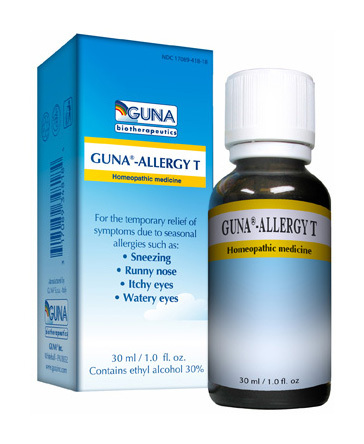 Guna-Allergy T (formerly Guna-Allergy-Treat) provides temporaryξrelief of symptoms due to seasonal allergies such as sneezing, runny nose, and itchy and watery eyes. Adults and children 12 years and older: 20 drops in a glass of water, 2 times per day. Children between 6 and 12 years old: 10 drops in a glass of water, 2 times per day. Children under 6: 5 drops in a glass of water, 2 times per day. If you have been diagnosed with seasonal allergies before, and are now experiencing the same symptoms, use this product as directed. ξConsult a doctor before use if you are allergic to bee stings. ξDiscontinue use and consult a doctor if your symptoms of sneezing, runny nose, itchy eyes and watery eyes worsen or persist for more than five days. If pregnant or breast-feeding, consult with a doctor before use. Keep out of reach of children.